Based on “Iron Man” created by Stan Lee, Larry Leiber, Don Heck and Jack Kirby and published by Marvel Comics. 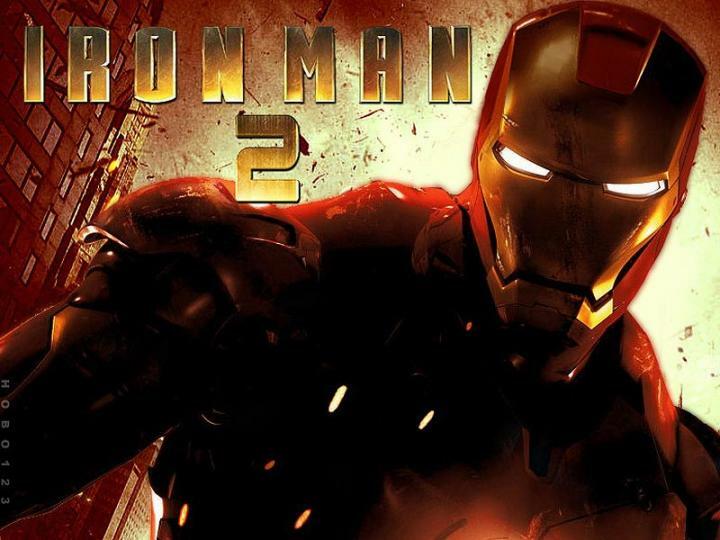 I think the success of the first “Iron Man” and IRON MAN 2 has to be given to both Robert Downey, Jr. and Jon Favreau. Nothing in their past movie work indicated that either of them were capable of producing such a hip, smart and fun superhero movie as the first one and they’ve pulled off the feat of making a sequel that is just as hip, smart and fun. IRON MAN 2 isn’t better than the first one. But it’s just as good and sometimes when you’re making a superhero movies that is examined with such a critical eye by lifelong fans of such a wildly popular character, ‘just as good’ is as good as you can possibly get. Tony Stark (Robert Downey, Jr.) seemingly has the world on a golden string. Thanks to his Iron Man technology he’s made the world a safer place. He’s hosting a Stark Expo, reviving a tradition started by his late father Howard Stark (John Slattery) where he outlines a plan for world peace. Tony’s so beloved by the American public that he can tell a Congressional Committee on national TV to go to hell. The Committee, headed by Senator Stern (Gary Shandling) demands that the Iron Man technology be given over to The Defense Department and Tony being the arrogant narcissistic genius that he is (hey, that’s what it says in his file) refuses, assuring the Committee that the rest of the world is years away from having anything remotely close to his technology. That’s before Ivan Vanko (Mickey Rourke) shows up, wielding fearsome whip-like weapons powered by a duplicate of the arc reactor that powers Iron Man and keeps Tony Stark alive. The secret of Vanko’s power source is wrapped up in a mystery involving Vanko’s father as well as Tony’s. A secret that is shared by the Director of S.H.I.E.L.D. Nick Fury (Samuel L. Jackson) who is aware that Tony is dying from palladium poisoning. Palladium is a necessary component of the arc reactor and won’t work without it. There’s only one way to save Tony’s life but that involves the impossible: creating a new element. But Tony may not have time to accomplish that feat seeing as how his best friend Air Force Lt. Colonel James ‘Rhodey’ Rhodes has given the Defense Department Tony’s Mark II version of the Iron Man armor. The suit is handed over to Tony’s main business rival Justin Hammer (Sam Rockwell) with instructions to weaponize the suit to the max. Doing so will turn the wearer of the armor in a veritable War Machine. Fortunately Tony has plenty of help thanks to his able assistant Pepper Potts (Gwyneth Paltrow) who steps up to the plate and takes over running Tony’s company while he’s dealing with his multiple problems. And as always, Tony is ably backed up by his bodyguard/chauffeur Happy Hogan (Jon Favreau) And if that isn’t enough, there’s Tony’s new assistant Natalie Rushman ( Scarlett Johansson) who is really S.H.I.E.L.D. agent extraordinaire Natasha Romanoff aka The Black Widow. Now even in that brief summation of the plot you should get the impression that there’s a lot going on in IRON MAN 2 and you’re absolutely right. There’s a whole lot going on but the story isn’t anywhere as confusing as I’ve heard folks say it is. And I appreciate a superhero hero movie that has a lot of pieces in play. There are a lot of characters in the movie and they’ve all got their own agendas working. It makes for a story where all the characters have something at stake and aren’t just hanging around. Robert Downey, Jr. once more does a masterful job of playing Tony Stark/Iron Man. I don’t know of another actor today who can play such an arrogant jerk and make us love him. I put it down toDowney’s unpredictability as an actor. You just don’t know what he’s going to do next but you know it’s going to be amazing. The rapport he has with Gwyneth Paltrow on screen is nothing short of terrific. It’s truly fun to watch anytime they’re on screen together. Don Cheadle replaces Terrence Howard as Tony’s best friend Rhodey and it’s an upgrade as Cheadle is by far the better of the two actors and he and Downey have a much better on-screen rapport. Gary Shandling is surprisingly good in a small but pivotal role. Sam Rockwell doesn’t play the Justin Hammer of the comics but his incarnation of the character is just fine by me. Sam Rockwell is one of the most dependable actors working today as I don’t believe he’s capable of turning in a bad performance. 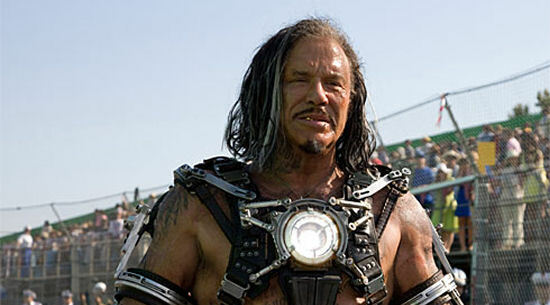 Mickey Rourke fits in surprisingly well as the main bad guy. Rourke’s character doesn’t say a whole lot but his actions are what sets everything else in the movie in motion and Hammer as he is in this movie simply isn’t strong enough of an antagonist for Tony Stark/Iron Man but I strongly suspect we’ll be seeing Justin Hammer again and he’ll be a lot meaner next time around. What else? The screenplay by Justin Theroux is marvelously smart and witty and contains actual dialog and not stock conversations we’ve heard in a dozen other action/superhero movies. Everybody has a unique voice and it’s always a pleasure to listen to dialog written by somebody who knows how to write it. My major gripe with this movie? You’re not gonna believe it but here goes: would it really have killed them to name Clark Gregg’s character Jasper Sitwell? Because I don’t care what they call him, that’s who he’s playing. And I want more Black Widow movies starring Scarlett Johansson. So should you see IRON MAN 2? Chances are you already have and at this point are either giving me a nod of agreement or giving me the digitus impudicus. I thought it was a whole lot of fun and that’s what I want to see in a superhero movie. I like to see a superhero movie where the superhero is having fun being one. I like to see superheroes having adventures and overcoming adversity and defeating bad guys and saving the day. I’m tired of superhero movies where the so-called hero is whining that he can’t catch a break or pay his rent (I’m looking at you, Spider-Man) or wrestling with his inner turmoil and existential angst while bemoaning that he must labor under the curse of having superpowers. Sometimes you just want to recapture the wonder and excitement you felt when you were twelve years old on a summer Saturday afternoon with nothing to do but read a stack of your favorite comic books. IRON MAN 2 will make you feel like that if you give it a chance. Ya know….I noticed this was on Netflix Instant and decided to give it another try based on all this. I’ll retract my digitus. It was much better than I remembered. Still not as good as the original, but not bad. And maybe it was because of the residual good feelings I had after seeing THE AVENGERS but I watched IRON MAN 2 today and it also seemed to me to be better than the last time I watched it. Apologies for that previous comment. I had started to say that Iron Man featured a new element as well, but I was wrong. But when I was trying to change the comment, I accidentally posted it. Feel free to delete it, because doesn’t seem like I can. Anyway, I’m with you completely on this, D. I’ve watched Iron Man 2 about as many times as I’ve watched Iron Man and I love them both. I really don’t understand all the gripes the fan community has about this movie and I think I’ve basically attributed it to the classic sequel syndrome — unless the sequel completely surpasses the original, it’s considered inferior. Iron Man 2 is an extension of Iron Man, but because it doesn’t surpass Iron Man in the same way that X2 surpassed X-Men or Spider-Man 2 surpassed Spider-Man. Although I think that kind of thinking is pretty daft myself. Because with those examples I listed, those movies had a LOT that could have been done better, but were bogged down by another classic fault of comic book movies — which I’ll coin the origin syndrome — when a movie has to spend all this time on the origin of the characters and essentially make it the setpiece. Now I could be wrong, but that’s just my theory on it. Because, like you, I think that while Iron Man 2 doesn’t surpass its predecessor, it’s still on equal footing (and I do find it amusing that a lot of the same people who bitched about Iron Man 2 being a bad sequel then did a 180 when it was announced that Favreau wouldn’t return as director by saying that no one could do it as well as he did — make up your minds, folks). Plus, confusion? Maybe if you were asleep during the film, but in all the times I’ve watched it, I can’t think of one moment when I was confused about what was happening onscreen. And yes, Cheadle is definitely an upgrade. With Howard’s Rhodey, it felt like he was perpetually annoyed with Stark, as if he was forced to deal with him as opposed to being his friend. He is, as he said on the scene on the plane, Tony’s babysitter. That contrasts with Cheadle, who, even when he’s fighting with Tony, you get the feel that there’s a much more brotherly relationship between them. And that’s how it should be with these characters. Eh, I don’t think I was confused by IM2 so much as disinterested. I have a gripe about something small. I absolutely HATE it when a story is about making a new ELEMENT since all of the stable elements have been discovered and the bigger ones have lives measure in fractions of a second. For some reason that takes me out of the story when a new compound would suit me just fine. Also I did think it was absolutely rediculous that Tony’s dad hid the secret in a model that he wasn’t even sure would still be around years in the future. Digitus impudicus here, Derrick. 🙂 This one sorta put me to sleep in the theater. i don’t really know what problem I had with it. It just didn’t sustain my interest. And although Cheadle is a better actor, I preferred Howard in the role and missed him. Terrence Howard is one of those actors who strikes me as being too full of himself and being too much into being an ACTOR, knowhutImean? I really couldn’t see where his performance in “Hustle and Flow” was all that terrific and he was perfectly fine in “Iron Man”. Its just that personally, I like Don Cheadle much more. Maybe I couldn’t mentally get over the hurdle that he was the only character whose face changed. I really liked Howard in Hustle and Flow, but I have heard he’s a bit of an a-hole. I didn’t much care for him in Red Tails, actually.